A very interesting read – measurement of dustfall rate within a residential home using small filters. Nuisance dust complaints received from residents living in the vicinity of a coal fired power plant in the eastern United States prompted development of a monitoring program to quantify the frequency of incidents as well as the magnitude of the problem (if any). While all of these techniques have been employed for collection of surface dusts they were not suitable for the current application for one or more of the following reasons: 1) not suitable for gravimetric measurements (wipe sampling for example) , 2) designed for the collection of wet and dry dusts combined and not dry surface dusts only (passive collection in open faced containers for example), 3) qualitative characterization only of dry dusts present on surfaces (adhesive tape sampling for example 4) ease in deployment and recovery at multiple stations simultaneously. 6) field samples after gravimetry were suitable for further chemical analyses employing non destructive techniques without the need for pretreatment (filter based device). As a result, a pre-existing filter sampling technique (Dzubay, T. and R. Barbour, 1983.) was selected for use in dust fall monitoring. The filter sampling technique was modified and a monitoring program designed to meet the above characteristics. The total dust fall monitoring program included measures for validation of the customized monitoring method as well as collection of data defining what constitutes background particulate levels in the study area. These background levels were needed as a “benchmark” in assigning significance to the program’s collected data in the absence of published regulatory values. The monitoring program was designed to measure total dust fall (non-respirable) as surface dust deposits and relied on passive particulate collection devices. 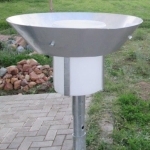 Preconditioned and pre-weighed filter media were deployed at ten (10) sites in the metropolitan area. Residential hosts who agreed to participate in the program on a voluntary basis operated the majority of the sites used. Criteria for site selection included coverage of all wind vectors in the vicinity of coal handling processes at the power plant as well as residential properties where nuisance dust complaints had been recorded previously. Filter collection media were employed for sampling events expected to last one calendar week or seven (7) days. This provided an exposure period that maximized collection of particulate matter, and yet limited non-detected values. All residential hosts received training in filter deployment, recovery, handling and shipping procedures. The primary purpose of the program was to conduct a total particulate or “total dust fall“ monitoring program in the vicinity of the coal fired power plant employing passive dry deposition techniques. It was anticipated that the results of this program would assist the facility in determining the fate of dusts potentially released during coal handling events at the facility, as well as, in the identification of likely sources of dust deposits observed in offsite residential properties.